• Languages that have contributed words and expressions to American English: Native American languages, Dutch, French, Spanish, Yiddish, Italian, German and Irish. • Examples of American colloquial expressions, with explanations of their meaning and origin. • Practical examples of spoken American English, with audio recordings, transcripts, translations and explanations of the language. • Examples of how American speech sounds, including some features of speech that we all share and some others that are regional. • Differences and similarities between American and British English, and the flavors of English in other places. • Social and regional differences among styles of American speech; regional and local accents. • Bibliography for students interested in further study. • A complete list of all the most commonly used British and American synonyms, those cases where the nations use different words for the same thing. For example, where in Great Britian they talk about a lorry, an American will call it a truck. I took great care to prepare the list by researching many published sources and by compiling it over a long time. I also got some occasional help from British and American colleagues who reviewed the list and suggested terms. • The audio recordings included different kinds of readings. There were sample dialogs and conversations, which were then broken down into listening and repetition practice. There were also readings of the many short essays throughout the book. 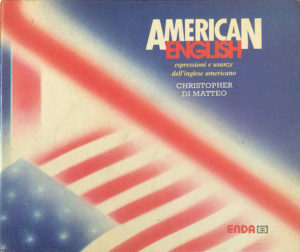 As the producer of the recordings, I hired different Americans who were in Milan, as voice artists, including some experienced actors.